Updated: April 23, 2009, 11:33 p.m.
One Gainesville family will plant a pomegranate tree this Arbor Day as a way to honor their son’s short life. April 24 marks the day Christopher Jordan "C.J." Godhard died last year at just 40 days old. 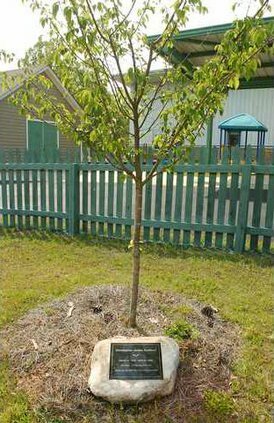 As a memorial to their infant son, Margaret and Chad Godhard began a Web site, treesforcj.com, encouraging people to plant trees in honor of C.J.’s memory. Margaret Godhard said after C.J. died, she asked people to plant trees instead of sending cut flowers. "We wanted something that would be a longer living memorial," Godhard said. "Trees are one of the greatest symbols of life." C.J. Godhard died April 24, 2008, because of complications from Trisomy 13, a rare chromosomal disorder. Following C.J.’s death, Godhard said she and her husband were inspired by the wind blowing through the sturdy pines in their yard. "It was really comforting ... the breeze in the trees," Godhard said. "That was the birth of Trees for CJ." Godhard said she chose trees because they produce oxygen, which C.J. had to receive through a machine during his short life. "One of the things C.J. couldn’t get enough of was oxygen," Godhard said. During the past year, a number of trees have been planted around Gainesville and throughout the world in C.J.’s honor. The MOMS Club of Gainesville, which Godhard is a part of, planted a cherry tree at Challenged Child and Friends. She said that was a meaningful tree because it blossoms in early April, during the month that C.J. was alive. A friend of Godhard’s husband planted a tree for C.J. in a Wisconsin park, directly across from Lambeau Field, where Chad Godhard’s favorite football team — the Green Bay Packers — play. Trees have even been planted as far away as Israel and Holland, Godhard said. "Planting trees has been very therapeutic," Godhard said. "We’re humbled by how many lives C.J.’s touched."